Last night we made a quick dinner of “pork” barbecue (fake soy bbq of course) sandwiches with a side of mac n cheese, a dinner suited for a fun Rosé from say… Chile. 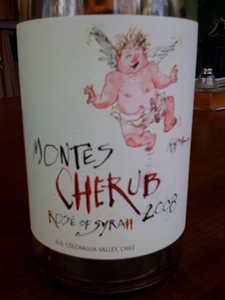 The 2008 Montes Cherub Rosé of Syrah ($13.99) is made from 100% of the varietal, grown in the Colchagua Valley of Chile. Cherub, which means young angel, is fitting as the label dons a cartoon diapered angel representing Montes founding partner and beloved friend Alfredo Viadurre. Fun but serious Rosé that got right down to business with it’s deep rich pink color and very aromatic nose of classic strawberry and raspberry. Paired very nicely with the food, and would be great with the plethora of foods that arrive at summertime cookouts. Chill it down a little be extra and it would be a great dry wine for enjoying on a hot summer day or at the beach and the screw cap enclosure makes that even easier. With spring just around the corner, it is almost Rosé season, although really any season is Rosé season. But spring and summer are a particularly good time to enjoy these nice clean and fruity wines. At work the other day I got the chance to taste the 2008 Domaine Sorin Cotes de Provence Rosé, perfect for the summer time temps of 80 degrees we were having here in Richmond. The winery which is technically in the Bandol AOC produces this less expensive version of their other Rosé that is every bit as good, but half the price. ($15) Comprised of 40% Grenache, 40% Cinsault, 10% Mourvedre and 10% Syrah the Domaine Sorin Cotes de Provence Rosé expresses beautiful strawberry, raspberry and floral notes on the nose with similar flavors on the palate with a clean mineral driven finish. With a medium bodied roundness in the middle of the sip you are pleasantly surprised that the finish yields a refreshing crispness, readying your mouth for the next sip. At this price this would be a great sipper for warm evenings on the deck or a great wine for grilling out if you are a in a bind for what to pair with the variety of foods that show up at a cookout. I am sure as summer approaches I will have more great Rosé reviews for you, but if you see this on store shelves definitely pick up a bottle. Too bad Rosé isn’t traded on the stock exchange, because sales are on the rise! An article today in Wines and Vines tells us that Rosé may be shedding its oh so wrong image of a sweet wine for beginners. The bad public opinion of the beautifully pink drink stems from images of drinking White Zinfandel and other sickly (in my opinion) sweet pink wines that arose in the late 70’s through the early 80’s (I think my dates are right). But Rosé is a wonderful wine that Megan and I really got into last year and if you read the W&V article, we aren’t the only ones. 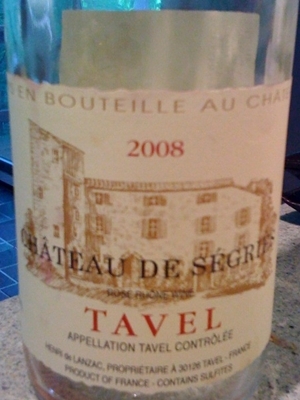 Rosés that are made in the traditional dry or slightly off-dry style are the best of both the red and white wine world. You get more body and the nice light red fruit notes from the red side of the family, and the crisp refreshing aspects from the white side of the family. Rosés go very well with many traditional food dishes included fresh cut fruit, which is a perfect pairing for a hot afternoon on the deck or at the beach. My favorite food pairings for a good dry Rosé are Indian and Thai dishes, where I would normally choose a Gewürztraminer or a Riesling. For summer time deck parties I usually have a bottle or two in the ice chest next to the beer and it is always a big hit. More evidence of Rose’s resurgence is its appearance on more and more winery tasting sheets. And the winery tasting room staff are usually quick to say something like “this is done in the dry or French style, so don’t worry.” I always get a kick out of that! For Virginia readers of this blog wanting to buy local and think you cannot get a good dry Rosé here in the Commonwealth, think again. Some Virginia wineries are putting out some very nice Rosés that can go toe to toe with their domestic and foreign counterparts. Just a few of the wineries I have sampled from are Barboursville, Kluge, DelFosse, and Woodland Vineyard.